Successfully Added Smart Mini DLP Projector - 1080P Support, Android 4.4, Wi-Fi, USB, HDMI, 100 Lumens, 854x480 Resolution, Built-in Speaker to your Shopping Cart. This compact Mini Projector is in a whole different class. In addition to being able to project a large screen onto any surface (with 1080p support and up to 100 Lumens), it comes with an Android 4.4 operating system and Wi-Fi connectivity - opening up a whole range of new entertainment possibilities. They say the best gadgets are practically invisible, but elegant when noticed. This is exactly the case with this mini Smart DLP Projector. The device comes in a super compact size and can easily follow you to wherever you need it as it slips easliy into your pocket or bag. So, whether you want to relax with a movie night at home or stun potential investors with an awesome presentation – this DLP projector is just the gadget you are looking for. While most projectors are only tasked with getting an image or video onto a larger screen, this small yet powerful projector goes several steps beyond that. 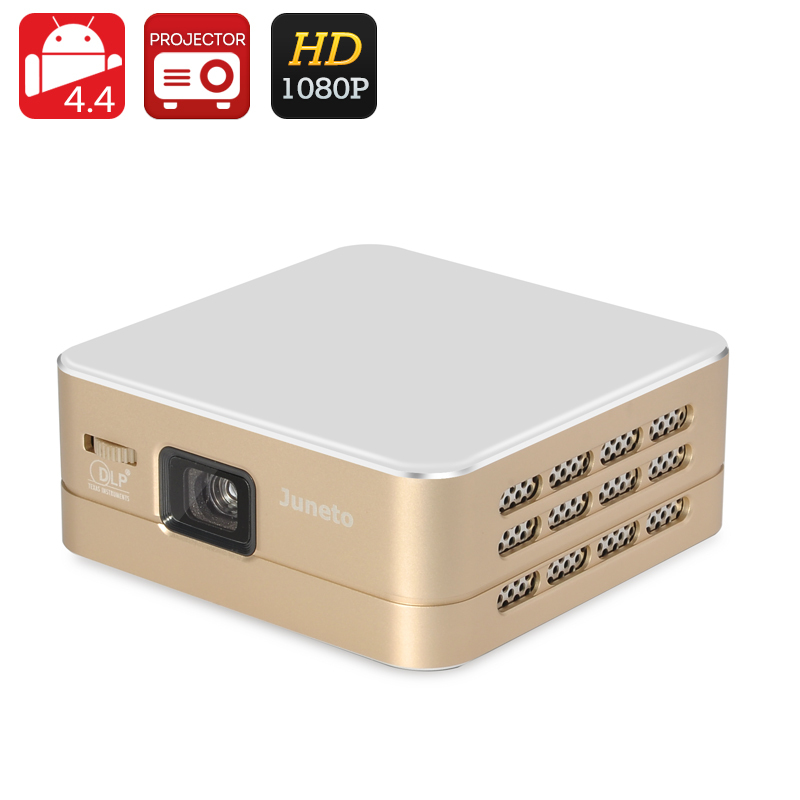 The smart projector comes with an Android 4.4 operating system, making for great interaction with the device and giving you access to tons of great Android content. Featuring Wi-Fi connectivity, the smart DLP projector can connect wirelessly to lots of other devices – for instance, sports action cameras – making it super easy to instantly view content on a large screen. Of course, wire-based communication is also available and you can hook up other gadgets through HDMI/MHL, USB 2.0 and micro USB. Weather you want to watch a movie or do a presentation at the office, image quality matters and can make a big difference in the overall viewing experience. This projector supports 1080p playback and is capable of projecting a 850x480 image onto any surface. You will get up to 100 Lumens of brightness - plenty to get a clear image at any time of day and in any lighting environment. The projector’s LED lights come with up to 30,000 hours of life as well – plenty to get the most out of the experience. This Mini Smart DLP Projector comes with a 12 months warranty, brought to you by the leader in electronic devices as well as wholesale DLP projectors..